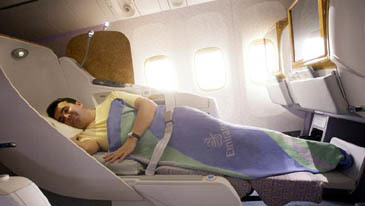 Emirates Airline to launch its new generation lie-flat Business class service soon. DUBAI (WAM) — Emirates Airline has raised the stakes in the fiercely-contested premium traveller segment with the launch of its new generation lie-flat Business Class seats on Aug.9.. This investment is a new milestone in a series of recent inflight product enhancements for the award-winning airline, and it is a move expected to win the thumbs-up from more travellers on long-haul flights. Passengers flying Emirates' new Boeing 777-300ER between Dubai and London Gatwick today, will be the first to sample this new Business Class offering. By year's end, another six Emirates jets will be operating with this new Business Class product. All of Emirates' new long-range Boeing 777 aircraft on order will be fitted with lie-flat seats in Business Class, and the airline will also retrofit its current fleet of 12 Boeing 777-300 aircraft by early 2008. Emirates flies four times daily from New Zealand to Dubai and beyond, via Australia. Tim Clark, President Emirates Airline, said: "In the highly competitive segment for premium travellers, Emirates has a clear lead with a superior all-round product. "Our premium customers enjoy complimentary chauffeur drive service, dedicated lounge facilities at major hub airports worldwide, and unmatched inflight entertainment and service onboard a young and modern fleet. The new Business Class seats we are introducing on our Boeing fleet, together with our flat-bed 'SkyCruiser' privacy seats in First Class, will strengthen Emirates' appeal to premium travellers seeking that extra luxury and comfort, particularly on long-haul flights." Emirates' new Business Class will offer the latest in inflight amenities and comfort, with the lie-flat seat boasting an in-seat massage function, large privacy dividers, and handheld controls. Business class passengers can enjoy more than 600 channels of entertainment from the airline's industry-leading ICE (Information, Communication, Entertainment) system, and that too on a generous 19-inch screen.